I hope you enjoyed Martin Luther King, Jr. Day and celebrated his commitment and dedication to equity and justice for all Americans. On Wednesday, January 9, I was honored to be sworn in to represent you for another two years and I am looking forward to the great things we can accomplish together. We have new constitutional officers including Governor JB Pritzker, Lt. Governor Juliana Stratton, Attorney General Kwame Raoul, and we celebrated the re-election of Secretary of State Jesse White, and State Comptroller Susana Mendoza, and many new faces in the House and Senate. The first few weeks of this new legislative session was busy with the reorganization of committees and assignments of new positions. I was extremely honored to be selected to chair the Higher Education Committee for our state and I am hopeful we can all work together to make Illinois an even better place to attend school, live, and work. This term, I’ve requested to be a continuing member of the budget team, where I can continue to advocate for resources for our human service field and additional resources to address reduced tuition costs at the University of Illinois. We will reconvene on Tuesday, January 29. I hope you will follow my newsletters through the 2019 Legislative Session and follow me on social media for up-to-date announcements. 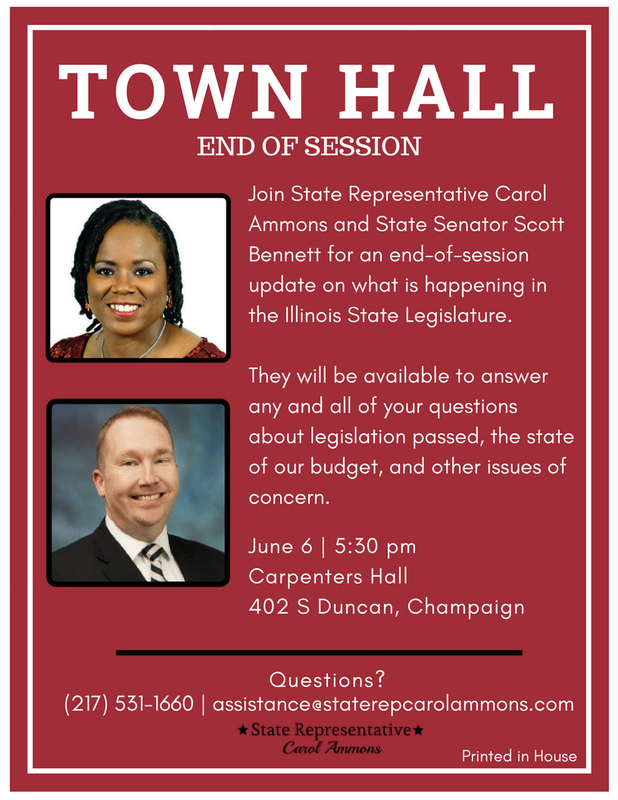 State Representative Carol Ammons invites you, the Champaign Urbana community, to join her next Wednesday, June 6th, at 5:30 PM for a joint town hall with Senator Scott Bennett to wrap up this year’s legislative session. The legislators will take questions as well as discuss legislation passed and the state of the budget. Still interested in interning this Fall? The Assistant to the Chief of Staff position is now open! This is a great opportunity to learn about the inner workings of local politics. 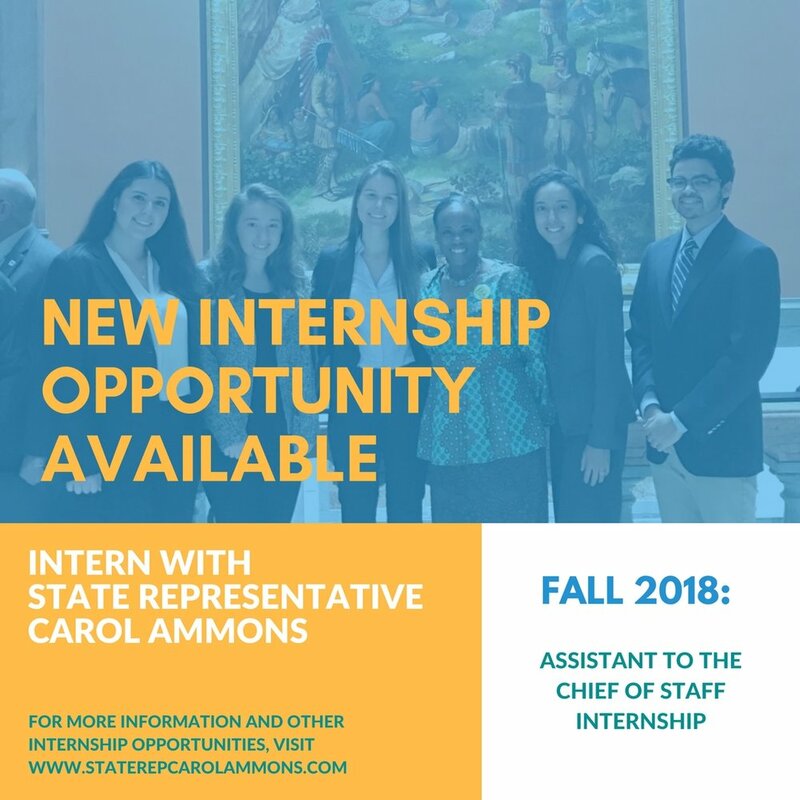 Visit the "Intern with Carol" tab to learn more about position responsibilities and how to apply!